The HQ SERIES HQ-31 features ART’s FDC Feedback Detection Circuitry. The A R T proprietary FDC differs from similar systems in that it is extremely fast. Although it illuminates the band with the greatest energy with the brightest LED, it doesn't fully discriminate between bands and will not get "stuck" on one band when there is no signal. The HQ-31 utilizes a set of indicators that show which of the many EQ bands has the greatest energy. The LED indicators can immediately show which band corresponds to the feedback frequency, allowing the sound engineer to reduce gain in that band to quickly kill the feedback while having a minimal impact on the sound of the live program material. FDC also acts as a simple spectrum viewer while the concert proceeds showing where the “hot” areas are. During system setup and sound check, the FDC may be used to help identify room and sound system resonances. By increasing the gain until feedback, it is easy to identify those frequencies that are likely to be problems. Reducing the gain in these bands helps tune the sound system, and, remove problem areas before the show begins. It also helps increase the gain margin before feedback. 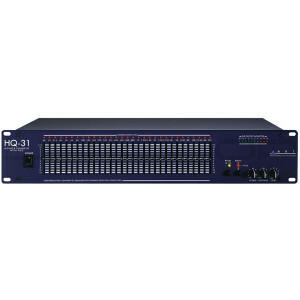 The HQ31 also features Constant-Q circuitry, 45mm center detent sliders with selectable boost or cut range of 6dB or 12dB, balanced XLR, ¼” and unbalanced RCA input and output connections, high and low pass filters, analog level metering, variable input controls, signal clip level indicators, ground lift switch, internal power supply and selectable line voltage. The rugged, all-steel chassis occupies 2U rack spaces and is intended for installation into standard 19” equipment racks. Applications for the HQ-31 include: Live Sound Systems/PA, Permanent or Fixed Installations, Church, Club and Practice PA Systems, DJ Sound Systems, Home and Project Recording Systems, and Monitor Systems.